Normally this news would be devastating, but the death of a star 160,ooo lightyears away in a satellite galaxy, known as the Large Megallanic Cloud, is actually incredibly beautiful! This photo of supernova (explosion of a star) SNR 0509-67.5 was recently released by NASA and is a testament to how beautiful even the farthest reaches of the natural (or celestial) world can be. 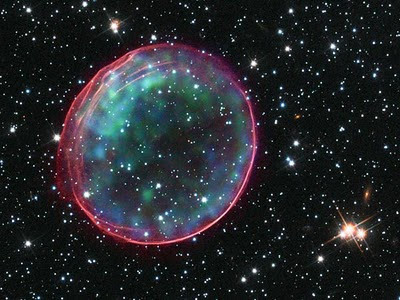 The pink ring is the gas being superheated by the resulting shockwave of the explosion - though not evident in this little photo, the supernova is 23 light-years across and is expanding at over 11 million miles per hour. How all of that is captured in this crisp little photo is unfathomable. Check the Harvard observatory website for more celestial information and awe-inspiring photos.